John Russell was born May 31, 1902 in Brooklyn. Tall, quick and tenacious, he acquired the nickname “Honey” from his aunt, who lived with the family during his childhood. His mother never liked the name and called him Jack, although she was outvoted by everyone in their apartment (and neighborhood). Honey inherited his athletic prowess from his father, who as a younger man had toyed with the idea of becoming a professional athlete. A diseased leg ended his sports career and the residual pain drove him to drink. A combination of the two landed him in a Paterson, NJ sanatorium for several years. Upon his return he argued incessantly with Honey, who was also eyeing a career in pro sports. His dad was set against it. Honey played basketball for the Alexander Hamilton High varsity and was arguably the finest young player in the borough. After his father died in 1918, he began playing for pay to support the family, at age 16. Honey had the size to play center and the ball handling skills to play guard. His first of many teams was the St. Mary’s Triangles, who paid him a few dollars a game. Playing for the Brooklyn Dodgers against the Paterson Crescents in 1920, Honey made 13 baskets, which was then a city record in top-flight competition. Soon the name Honey Russell was turning up regularly in New York sports pages. During these formative years, Honey played on several teams in the region—including the Newark Mules—logging roughly 100 games a year. His teammates included some of the top names in the game, including Marty Friedman, Barney Sedran, Red Conaty and Joe Brennan. In 1923, Honey followed Friedman to Cleveland, where department store magnate Max Rosenblum was assembling a formidable company team. The “Rosies” were kings of the Midwest—and Honey was heralded as the finest defensive player in all of pro basketball. He was none too shabby on offense. In 1925–26, the Rosenblums joined theAmerican Basketball League and he edged Rusty Saunders as the leader in points per game. He also had the highest-scoring game that year with 22 points. Honey was primarily a guard, which was a low-scoring position at the time. He made All-ABL four years in a row, and Cleveland won the league title in 1926. The following season, Honey was traded to the Chicago Bruins, whose player-coach was football legend George Halas. Honey talked Halas into letting him play for the Bears in 1928, as a two-way end. Halas benched him after one game, worried he might lose his prize basketball star. He is listed in the records as Reggie Russell. During the early 1930s, as the Depression made pro ball less lucrative, Honey began to think about life after his playing days. 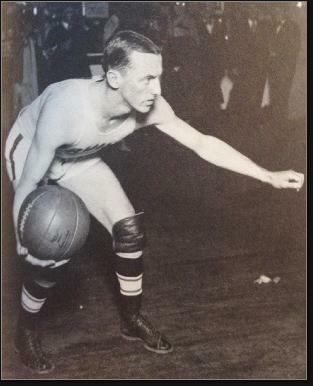 He accepted a coaching offer from Seton Hall in 1936. After one losing season, the Pirates had winning records each year through 1942–43, after which they suspended their basketball program because of the war. Honey instilled his trademark competitive spirit in his players and, in 1939–40, the varsity went 19–0. It was part of an amazing 41-game winning streak. Honey’s finest team was the “Wonder Five,” led by Bob Davies. They secured Seton Hall’s first NIT bid, in 1941. The Pirates lost in the semifinals to LIU, and then lost the 3rd place game to CCNY. 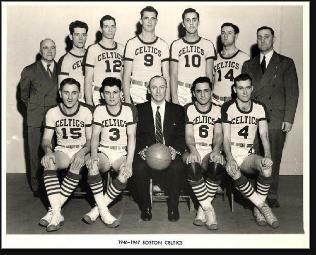 Honey coached the Boston Celtics during their first season, but preferred the college game. He returned to the Seton Hall sideline for the 1949–50 season and within a year the team was back to its winning ways. The Pirates went 80–12 during the next three years, attaining a Top 20 ranking in 1951–52 and rising to #1 nationally in 1952–53 before finishing with a #2 ranking. That year, Walter Dukes and Richie Regan led the team to the NIT Championship. Honey retired from coaching in 1961 and was among the inaugural members of the Basketball Hall of Fame in 1964. He later went in again as a college coach. His college teams had a stellar 294–137 record and he once calculated that he had played in more than 3,200 games. In the years after World War II, Honey worked 365 days a year. He promoted boxing and wrestling and various types of races. He also worked as an insurance adjuster in Newark. A keen judge of talent, he did some scouting for the Rams and Browns in the fall. 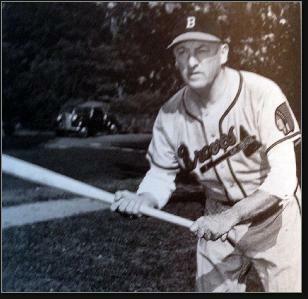 He spent his summers as an area baseball scout for the Milwaukee Braves. Among his notable discoveries in the 1950s were Don McMahon and the Torre brothers, Joe and Frank. Honey continued scouting, for the Braves and Expos. Among his New Jersey finds was slugging catcher Earl Williams. In 1971, Williams won NL Rookie of the Year and Torre was the NL MVP. Honey was still working as a scout for the White Sox when he passed away in 1973 at the age of 70 in his home in Livingston.